A simple yet flavorful gluten-free chili that is ready in no time. You are going to love this gluten-free chili recipe. If you’ve ever wanted to throw a fall dinner party, here’s the easiest way to do it (and it’s super economical). 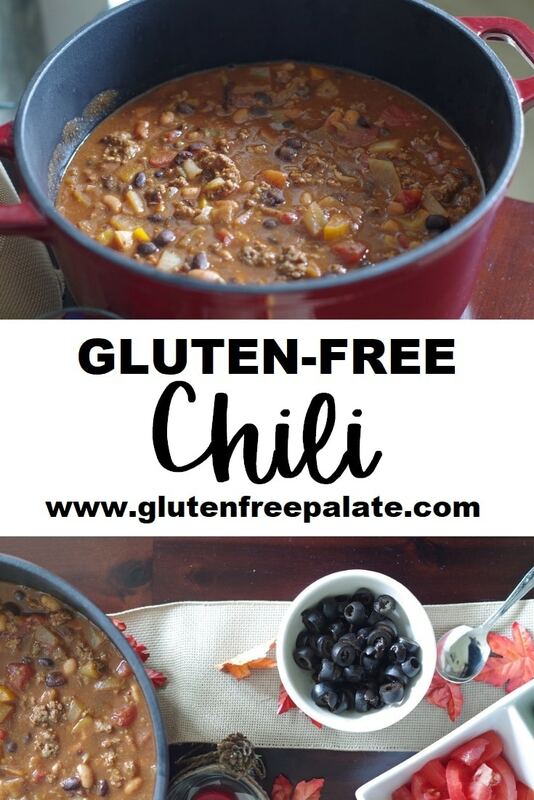 Host a Gluten-Free Chili Bar. You can have your toppings prepared, your gluten-free cornbread in the oven and your chili on the stove in less than thirty minutes. Easy-peasy. We scheduled our fall-themed dinner party and invited twelve people over. I knew right away that I wanted to do some sort or buffet, or bar. We’ve been loving all the Simple Truth Organic products and this past week Fred Meyer had a sale on the Simple Truth Organic canned goods, shredded cheeses, and meats. They had everything I needed for a Gluten-Free Chili bar. I walked away with all the ingredients I needed to feed a group of twelve a delicious, organic meal. I also snagged a few cute fall decorations to fancy-up the table I planned to serve from. But more on that later. My family of four served a variety of toppings with our gluten-free chili including chopped tomatoes, sliced olives, green onion, shredded cheese, and sour cream. 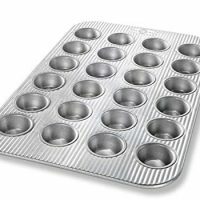 That way our guests could make their chili they way they wanted it before grabbing a mini cornbread muffin. All of the ingredients for the cornbread, chili, toppings, and drinks ran us just under $50. How many people can say they fed a crowd of 12-16 people a homemade meal that was not only organic, but delicious and filling? Ordering pizza for twelve people could have cost you more depending on where you live and what kind of gluten-free pizza you ordered. And lets be honest, pizza parties are easy but they aren’t as fun (in my opinion). I love the variety of products that Fred Meyer offers in the Simple Truth Organic line of products. I can find almost anything I need, it’s inexpensive, and it’s organic – making it a brand that we turn to often for meals and snacks. Now onto decorations: We decided to go all out on decorations for our Gluten-Free Chili bar. Decorations can get expensive, so we first rummaged through the house and found decorations and serving platters that had fall colors, or a natural look to them. Think browns, oranges, and reds. Metal buckets, cutting boards, and ribbon make great decorations and most people have at least one of the three in their house. When I was out shopping I picked up a couple of candles, candle holders, a fake pumpkin, and some fake leaves to spread across the table. The wood panels and chalkboard came from other areas of my house. All-in-all, I spent less than $10 on decorations. 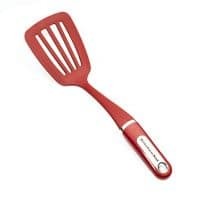 Even if you don’t have anything I listed above, you could pick up a wooden cutting board, and small metal bucket and not only use them for your party, but use them for other parties, or in your kitchen. 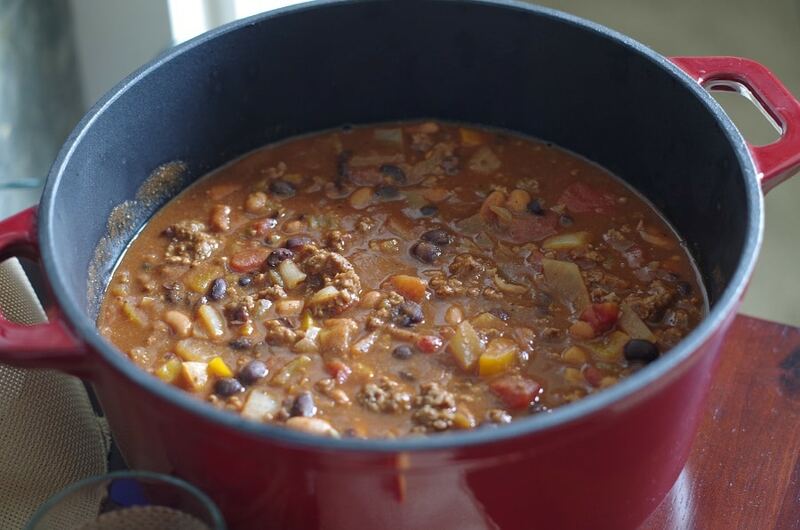 While this chili is pretty quick to make, The Gluten-Free Pressure Cooker has a mouthwatering Instant Pot Chili recipe you might want to consider. Once you set the timer, you’re free to set up the rest of your chili bar while it cooks. 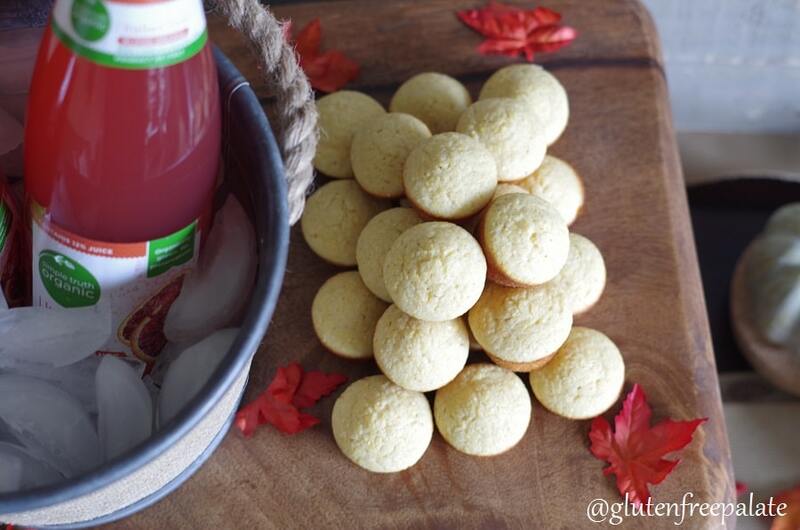 Get my recipe for Gluten-Free Cornbread Muffins to serve with your gluten-free chili. If you are looking for a Paleo chili, or a vegetarian chili, Natalie from Perry’s Plate has you covered with her Vegetarian Paleo Chili. 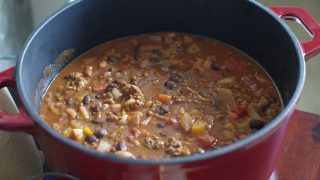 A Mind “full” Mom has an Instant Pot Chili that you’ll love. 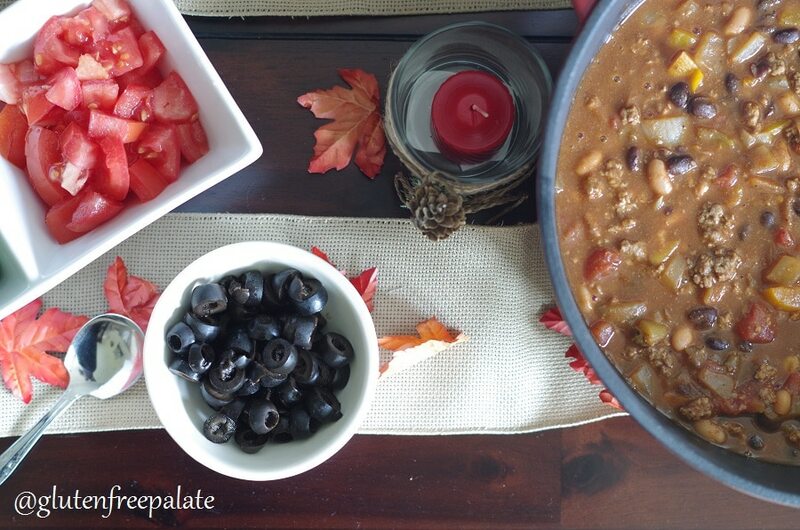 If you make this gluten-free chili, please come back and let me know what you thought! If you have a question, please leave it in the comments and I will get back to you. 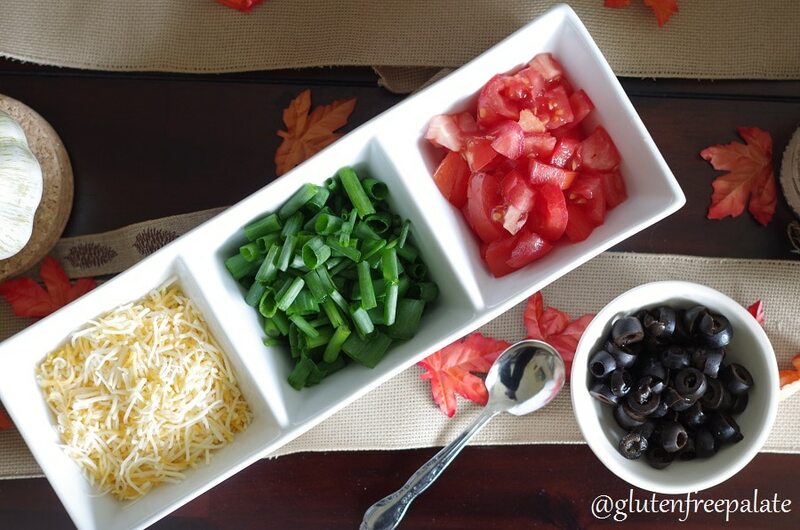 Host your next dinner party with a Gluten-Fee Chili Bar! This gluten-free chili is ready in less than an hour and the chili bar is super easy to pull together. 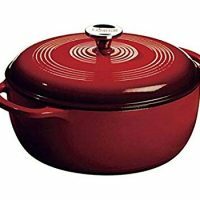 Cook ground beef, onions, and bell pepper in Dutch oven (or large pot) until the ground beef is cooked through and the onions are translucent. Add diced tomatoes, tomato sauce, seasonings, and chiles and bring to a boil. Add beans and cover and simmer for 30 minutes. Serve hot with toppings and gluten-free cornbread. Now that is a fun idea!!! Great for a little party for sure! I love chili, this looks like such a fun idea for game day! I love this idea! I remember going to a dinner party as a kid and the theme was chili bar. I remember it was so much fun and I loved the food + all the toppings. Such a great idea! Capital A Adorable chili bar! You’ve inspired me to fancy-up our traditional Halloween chili bar. I am so glad you are promoting Simple Truth! I am so impressed with http://www.thekrogerco.com and all they are offering to the organic and special diet crowd now! We use their products all the time. This is such a great idea for a fall or Halloween party! Since we don’t all eat meat I could easily pair this with a baked potato bar so there is something for everyone! A chili bar sounds great to feed a crowd! It’s one of our new go-to’s! chili and cornbread. one of our family faves! I love making a big vat of chili and eating it all week. Your recipe looks perfect for a crowd! I love this idea! It would make for a great gf potluck. Everyone bring an ingredient to top the chili! Love it! I’ve done this at parties before and it always goes over so well! SUCH a good idea! I LOVEEEEEEE having the ability to “MAKE MY OWN” chili so to speak! We only have a two-person household, but I could so see making this for a weeknight meal with the toppers. It would be so wonderful for lunches or even a second dinner! This is such a fun party idea for a crisp fall day. Who doesn’t love a hearty bowl of chili? I love the Chili Bar idea! Easy and delicious! Such a cute set up too!